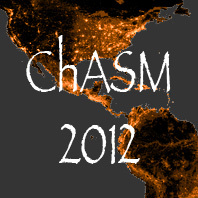 chasm: a profound difference between people, viewpoints, feelings, etc. Modern life is infused with a myriad of gadgets and new technologies that are quickly becoming online extensions of our offline lives. How we interact with others, where we are and where we go are all facets that are increasingly captured with ever greater detail by our online tools and gadgets.The digital traces constantly produced by these tools create hitherto unseen possibilities for the study of human behavior, but also pose their own challenges. The avalanche of data we are witnessing demands new tools and concepts to be analyzed and the new problems that are within our reach demand new algorithms and models to be developed. This workshop aims to bring together practitioners of both computer science and social science so that both may better understand the challenges faced by each other and how best they may collaborate to overcome them.